The banner above was from our hosting of an IB PYP workshop this weekend at the school. Over 100 educators from 26 different countries came to SOIS to attend 5 different workshops in English and Japanese. Last Thursday I attended the fall meeting of the Heads of School of the IB Association of Japan (IBAJ). IBAJ is one the numerous regional associations that has formed in countries throughout the world. This association is especially important here in Japan, because the IB Asia Pacific Regional Office overseas over 600 IB schools in 26 different countries. The association provides the IB schools in Japan, a forum to collaborate and support each other. The association also is a unified voice towards the Asia Pacific Regional Office in dealing with challenges specific to Japan. There are 27 schools in Japan currently offering at least one of the IB’s three programmes (PYP,MYP,DP). We at the Osaka International School of Kwansai Gakuin offer all three and we are one of only three schools in Japan doing so. Some of the meeting was spent discussing the structure of IBAJ as it is a relatively new organization. We also had video conferences with members of the IB Asia Pacific Regional Team, including the Heads of School Services and Professional Development. They will also be visiting the Kobe/Osaka area on November 22-23 and I hope to get a chance to meet them in person. We also received an update on the status of Japanese Ministry of Education’s (MEXT) initiative of attempting to have 200 Article 1 (Japanese national) schools earn IB authorization by the year 2018. This is a move by the Japanese government to train its future workforce to be more globally competitive in this interconnected world. MEXT is working on a collaborative project with the IB to offer IB courses in Japanese. The idea is for students to earn a Dual Language IB Diploma, with 2 courses in English and 4 courses in Japanese. The IB website has this link in both English and Japanese with more information about the initiative. The list of Diploma Programme courses now offered in Japanese is growing and includes economics, history. 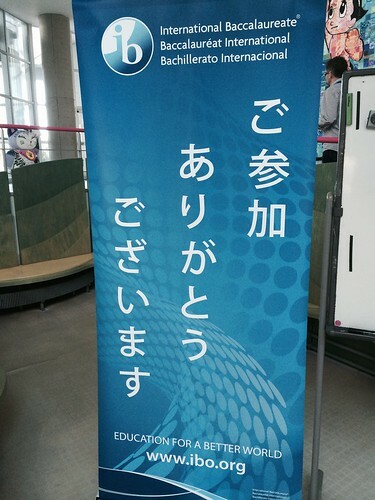 biology, physics, and as we learned at the meeting, mathematics is now in Japanese. s.
As for the 200 IB schools by 2018, progress is slow because of many factors. There is a lack of IB expertise and the costs are high for either training staff or getting qualified teachers. There are national curriculum demands that might make it difficult for schools to fit the IB requirements in the students already busy schedule. Finally, there are also language and culture barriers to get through to understand what it takes to start an IB curriculum. We spoke with Ayumi Hoshino, the IB Developer for Japan and she highlighted the numerous workshops taking place throughout Japan. I remember she said there were about 12 schools moving that are applying or going to apply for authorization. We are SOIS are in an ideal situation. The Senri International School received a grant three years ago to explore the IB curriculum and over 70% of their faculty has received some training in IB pedagogy. They are moving towards offering some classes in IB in the near future. The eventual goal would be to have the full, IB Dual Language Diploma available for all SIS students. OIS faculty would serve as mentors and the two faculties could work together to improve their teaching. It would also benefit OIS to have more students in the Diploma Programme and give us the chance to offer more courses, possibly IB Theatre, different foreign languages, and even going towards the IB Career-related Certificate., and be the first school in Japan to offer the fourth IB programme. The expansion of our IB courses would cause the two faculties to work more closely together, living the vision of the two school concept. This also fits in well with KG University and KG Senior High School winning the Super Global Awards from the government. SOIS is a role model for the globalization of education in Japan. Previous Post What are the students learning at OIS?